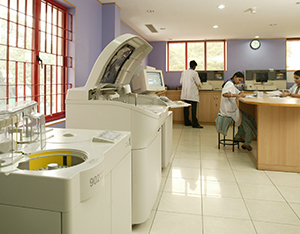 The Laboratory services at Dr. Mohan’s Diabetes Specialties Centre is unique in using advanced technology and having fully automated walk away systems in the department of Biochemistry, Hematology, Pathology, Microbiology and Serology which provide round the clock services, seven days a week. 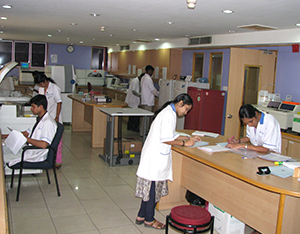 The laboratory is equipped with state-of-the-art equipment and has a team of efficient, motivated, knowledgeable and qualified biochemists and technical staff who are constantly involved in producing accurate and reliable results and upholding quality assurance. To avoid cross contamination and pre analytical error all the blood samples are labeled with bi-directional barcodes. Bi-directional barcoded samples are directly fed into the respective analyzer and results are automatically transmitted to Laboratory Information System (LIS) without manual entry to avoid analytical and post analytical error. 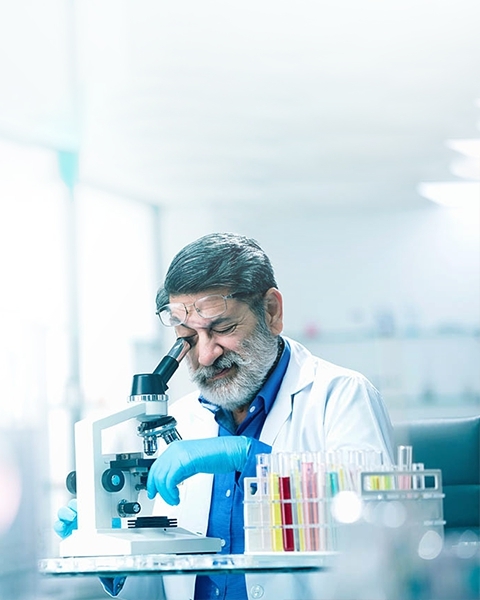 The laboratory’s Quality Monitoring system helps to improve the accuracy and reliability of results in term of internal Quality Control (QC) as well as external proficiency testing materials. Internal QC material is analyzed at predetermined intervals along with patient samples to monitor systemic and random errors. These materials are traceable to international certified reference material so that accuracy of measurements is monitored periodically. The initial step towards a cure is the diagnosis. The faster and more accurate the diagnosis, the easier and better the cure. The biochemistry department goes the extra mile by being committed to ensuring accuracy and precision in specimen handling, clinical testing and making available the latest investigation in the field, so as to facilitate faster diagnosis. 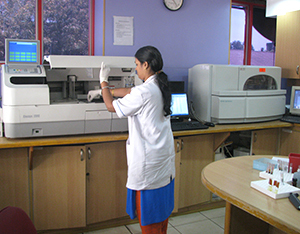 India’s first Bio-Rad Variant II turbo Glycated Hemoglobin (HbA1c) analyzer (throughput 40 test/hr), which has been certified by the National Glycohaemoglobin Standardization Program (NGSP), USA. EasyLyte Na/K & Cl analyzers, a completely automated, microprocessor controlled electrolyte system which used to analyze sodium, potassium, and chloride in whole blood, serum, plasma, or urine. Bio-Rad iMark™ microplate ELISA reader for the analysis of Anti-GAD, Zinc Transporter 8 antibody etc. The Hematology Department provides laboratory services for the diagnosis and treatment of all blood related disorders such as anemia, bleeding disorders and malignant conditions related to blood cells such as leukemia, lymphoma and myeloma. Complete Blood Counts (CBC) are analysed by Sysmex XN-1000 (100 samples/hour), XN-350(60 samples/hr) analyzer and Coagulation tests are performed in the automated Random Access Coagulation analyzer Sysmex CA 50. Urine analysis is used in detecting a variety of renal, pre-renal, urinary tract diseases. A semi-automated Cobas u 411 (600 test strips/hour) is used to rapidly detect PH, specific gravity, protein, glucose, bilirubin and other compounds in urine. The technician examines urine for microscopic elements such as red blood cells, pus cells, epithelial cells, casts and crystals. The Microbiology and Serology Department has high-end facilities for processing and reporting patient’s specimens in the field of diagnostic bacteriology, virology and parasites, which may cause a range of diseases. In addition to identification, the department is actively involved in infection control activities of the hospital. The samples are processed immediately; the reports are validated continuously and released. The turnaround time after postprandial sample reaches the lab, is on an average 60 minutes. The results are available within this period which reduces waiting time of patients. I am type 2 diabetic patients. If I do C-Peptide testing once, should I repeat it? If so how often? For Type 1 Diabetic patients. What is the duration of C-Peptide to be done? If I done it once should I repeat it every time? What are the uses of AGP? It helps to assess the glycemic variability throughout the day and helps to treat the patient very precisely. It is also very useful to detect early morning hypos especially in elderly. What is the specialty of HbA1c testing? It is used as a screening test to identify diabetes and regular monitoring tool if you have been diagnosis with DM to know how well your DM is controlled. Why should I do my electrolytes? Electrolytes are minerals in your blood such as sodium and potassium that maintain the balance of fluids in your body. High sugars upsets body’s electrolytes control system specially sodium and potassium Acid / base upset my result in a condition known as DICA which can be seen such as life threatening. So it’s important to check electrolytes. I did not do my Haemogram last time when I visited six months back. Will it affect my diagnosis? Haemogram plays a major role in determining the health of a patient. Various blood related components and details are known by this particular test which plays a vital role in diagnosis. Hemogram is important to assess infection, anaemia and platelet abnormalities. Sometimes anaemia can interfere with HbA1c values. Therefore Haemogram needs to be compulsorily checked.